"For everything there is an appointed time, and an appropriate time for every activity on earth:A time to be born, and a time to die; a time to plant, and a time to uproot what was planted;A time to kill, and a time to heal; a time to break down, and a time to build up;A time to weep, and a time to laugh; a time to mourn, and a time to dance"
Woke up to the news this morning about the passing of a great man, Mr Lee Kuan Yew. Thank you for all the sacrifices you've made for us the past 50 years, building Singapore, an amazing country that I call Home. It's very apparent to me how Singapore has truly grown under your leadership. Your vision has spread across the world, inspiring many. Many times while I was doing my exchange in Europe, the first thing everyone said when they heard that I was from Singapore. "Oh wow Singapore! I wanna go there some day, it looks beautiful"
"Haha yes you should! It's very clean and safe"
"You guys are really lucky, you know, Mr Lee Kuan Yew is a great man"
The first time I heard it was when I was in Santorini, Greece, at a seafood restaurant. A couple that sat at the table next to ours started chatting with us while we were both waiting for our food to arrive. I was so pleasantly surprised. You mean people know about our tiny red dot? They even know about mr LKY? 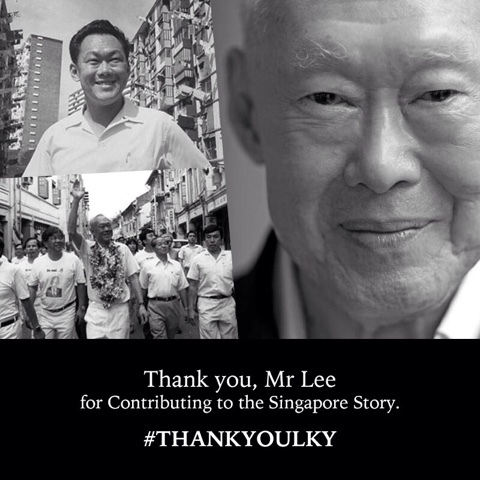 It was then I realised how influential and powerful Mr Lee was and how his leadership had brought us so far that everyone around the world has heard of his name. I remembered feeling so so proud to be a Singaporean that night, so blessed to be borned in a country so safe, clean, and just.. Amazing. I couldn't wait to go Home. As much as I loved jet-setitng across the globe, traveling and seeing the world. As much as we Singaporeans are forever complaining about the never ending work, tough education, overpaying our government etc.. We all know that we wouldnt be wishing for otherwise. It is something that became even more apparent to me, after living abroad on my own for 6 months and after traveling to 25 different cities and countries. The transportation system, the education system, the opportunities, the security, the cleanliness, the night life, the food, the skyline, the modern infrastructures, the lack of beggars around the streets.. Even the super fast wifi and 4G connection we have right now. These are the things you never thought you'd miss & be so grateful for. Not until they are taken away from you. Or rather not only until you have to spend a BOMB on them overseas and still receive something inferior. I wrote a blog post on the things that Exchange taught me, and I remember including that exchange has taught me to appreciate Singapore a lot more. And all these wouldn't have been possible without Mr Lee's dedication and sacrifices. So thank you, Mr Lee Kuan Yew for everything. May you Rest in Peace forever.